Definitely missed to boat on this place. It’s been around for ages but I only spotted it recently – it’s on a bit of Sussex Street I just don’t walk down generally – but glad I finally did. 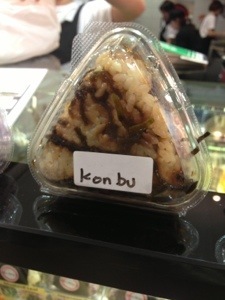 I wanted the bento which at $14.90 and with tons of sides looked great, but sadly they were sold out. 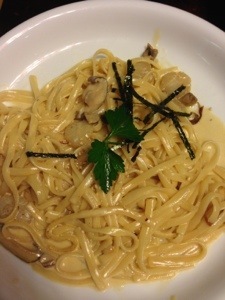 Instead got some Japanese spaghetti and a couple of smaller dishes to share. 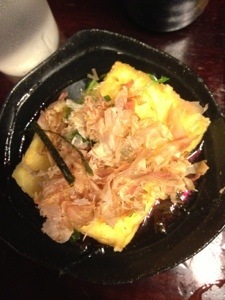 The agedashi tofu was wonderful, three giant pieces with lots of great sauce and crispy coating. The seafood salad was pretty big, could eat this as a whole meal. 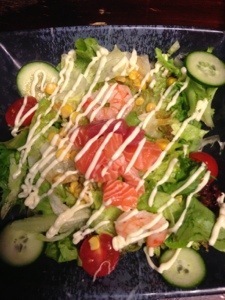 Good dressing and generous serves of chopped salmon and tuna and mayonnaise. Modern Japanese for sure, but so tasty. 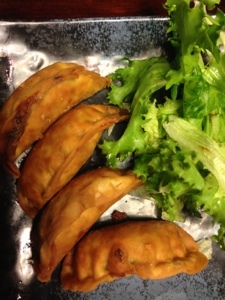 My dad went wild for these gyoza – not often you get vegetarian gyoza in Sydney so I was happy and the super crunchy outsides were really wonderful. 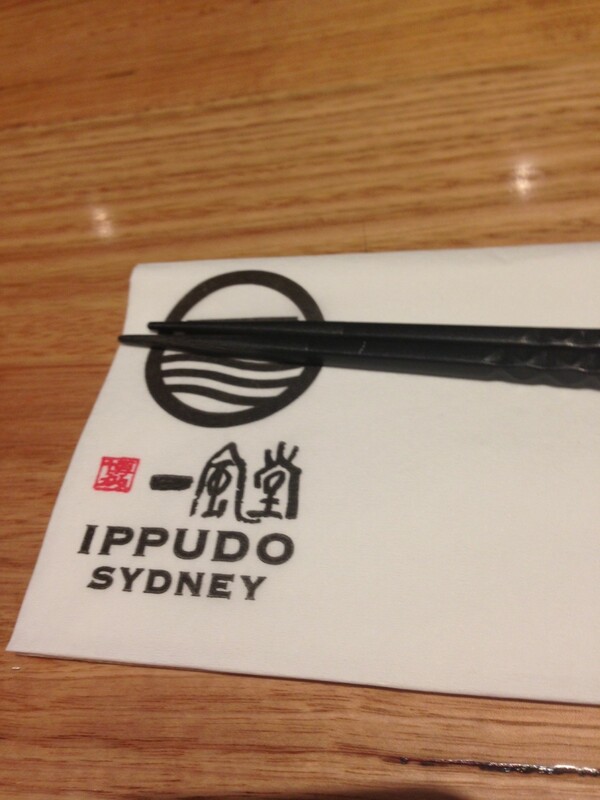 I wanted to go to Ippudo for a while, but it often takes longer to get to that place that always has lines out the front – you have to have enough time for the meal *and* for the queuing. We finally made it to Ippudo after a morning yoga class in our gym just around the corner (Virgin Active) and were pleased to be inside within about 5 minutes. It’s a lovely dark glossy space, pretty loud but not too oppressive. The fluffy buns with crispy prawns were wonderful. So often these kind of bao are meat options only and us little pescetarians or vegos miss out – this was a wonderful exception. 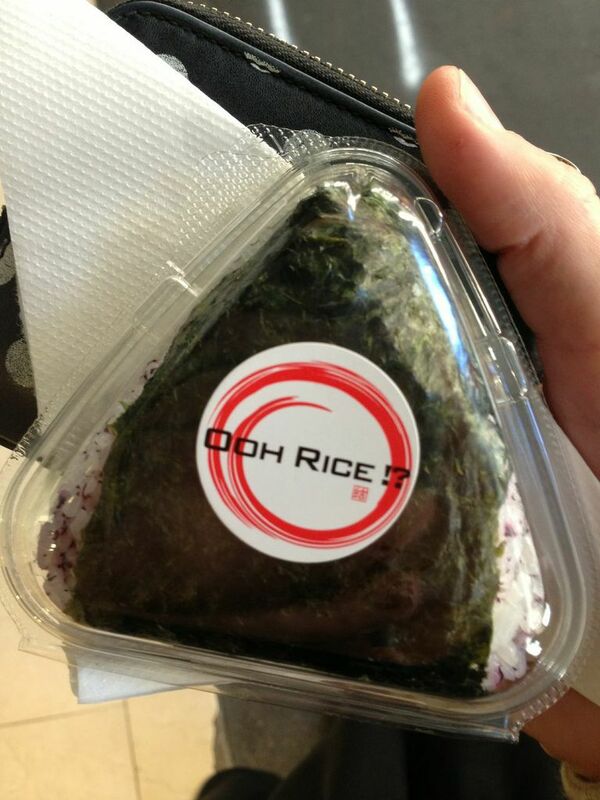 I would eat these EVERY DAY if I could. 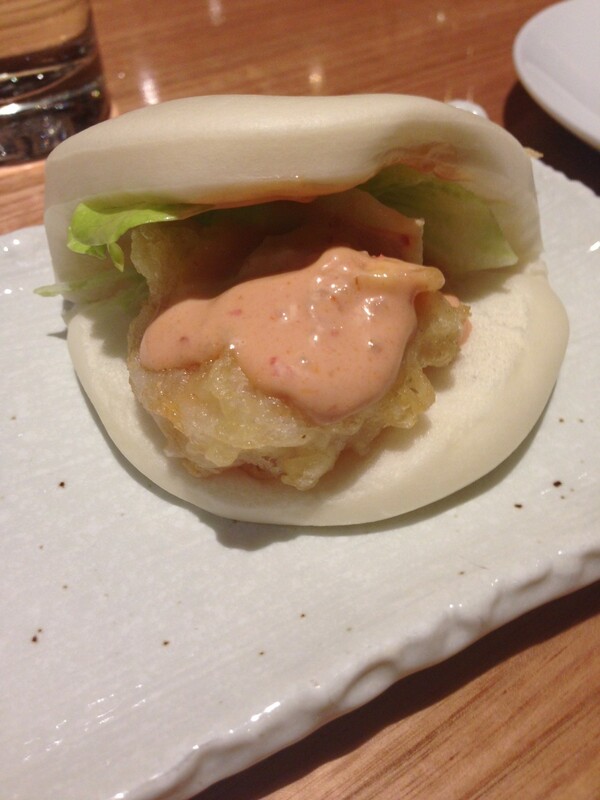 IPPUDO SHRIMP BUN $5 一風堂シュリンプバン Steamed bun with deep fried shrimp and IPPUDO original sauce. 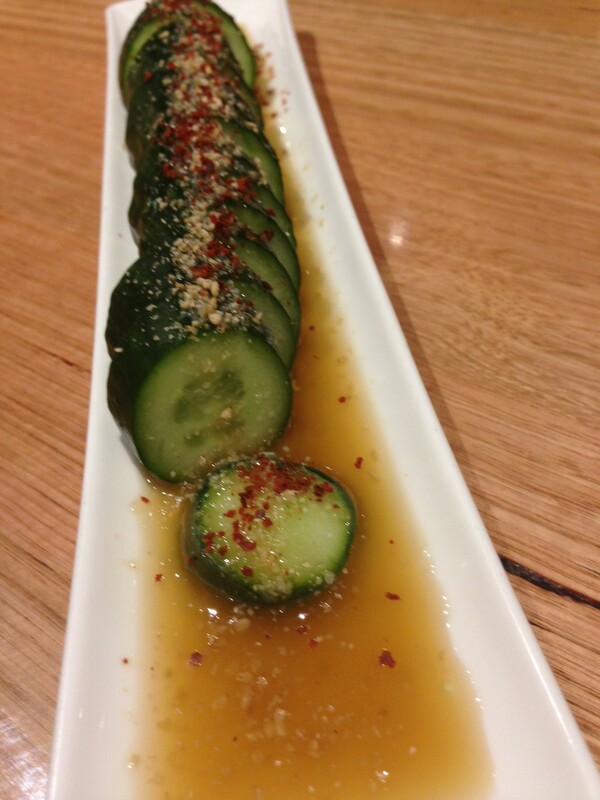 If you have a pickled cucumber on your menu I will order it. 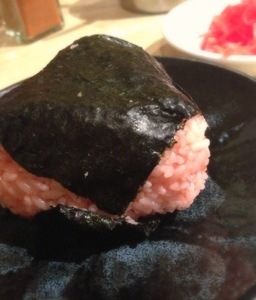 I love the freshness. 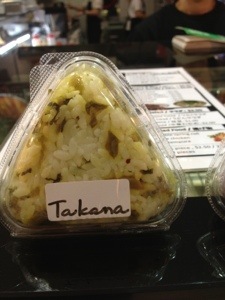 GOMA Q $7 胡麻きゅうり Japanese cucumber with sesame sauce. 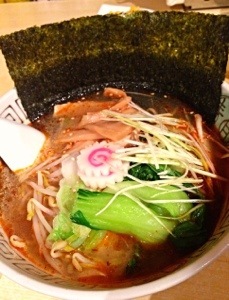 And then the piece de resistance – the vegetarian ramen. 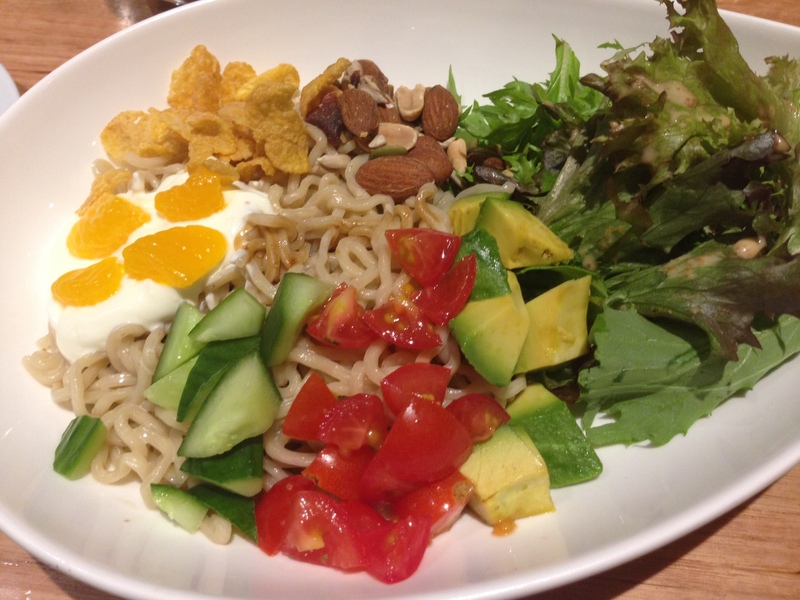 This was one of the weirdest things I have ever eaten – ramen with cornflakes and yoghurt and nuts and fruit and salad and more. It was surprisingly delicious even if I made little noises of surprise after every bite. 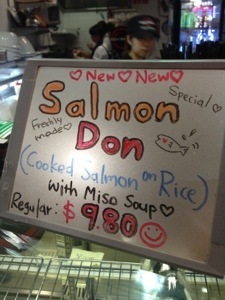 I am immensely sad to say that this does not appear to be on their menu any more. Major sad face. 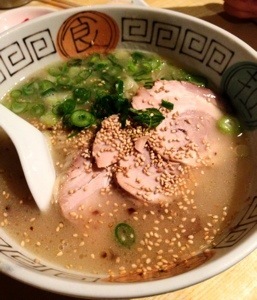 My boy got the more traditional ramen and made many happy noises while slurping it. Ippudo has quite a selection of noodle thicknesses and their noodles are a bit more al dente than the usual ramen shop offerings. 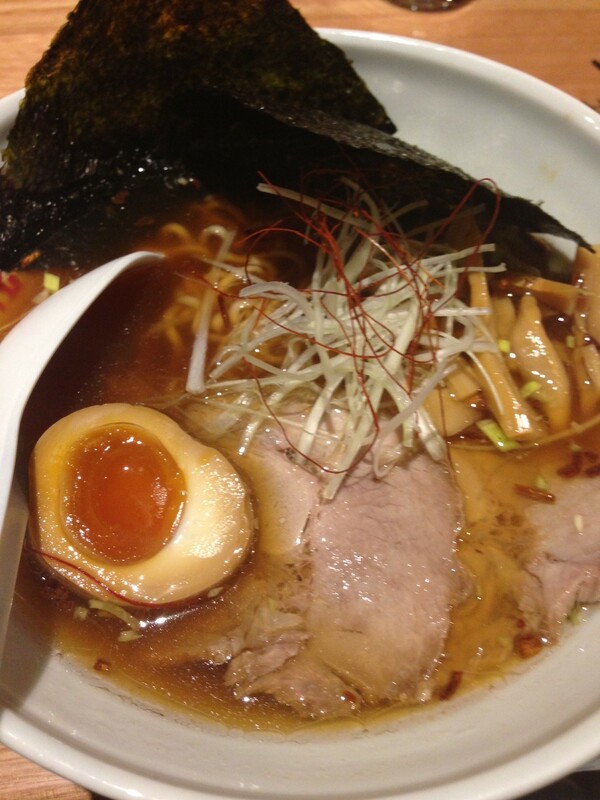 I had a tiny slurp of the broth and it was everything it should be – thick and salty, though too porky for me. 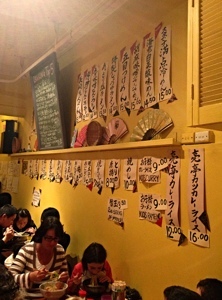 Izakaya Fujiyama, Surry Hills – Sydney loveliest Izakaya? 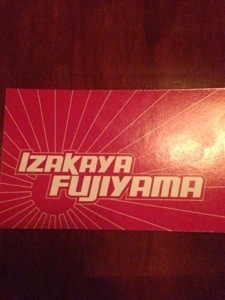 I have had Izakaya Fujiyama on my to-eat list FOREVER. Ok, well at least for a few years since it opened. 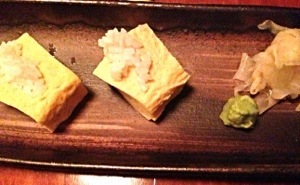 I love the move towards izakayas in Australia and the new Japanese offerings they are bringing to us. 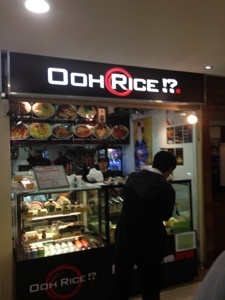 Safe to say we were not disappointed and that this might be one of my favourite new places in Sydney. 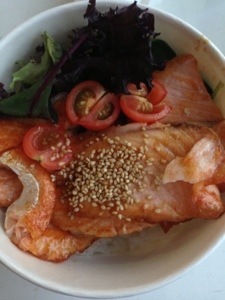 Sharing restaurants are tricky, so much depends on who you are with and what they like to eat. On this occasion my law school buddies and I matched well – mainly vego but happy to nibble some sustainable fish. You could definitely go all vego here and be happy though. 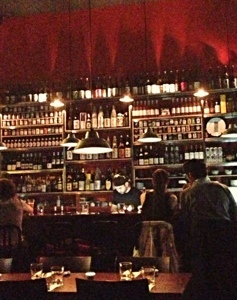 Super cute place on the still hot Waterloo Street in Surry Hills. Apparently the place next door is terrible though, so don’t go there! 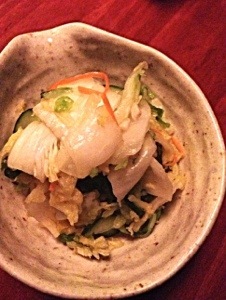 Mmmm tsukemono – pickles are my favourite and these were very good, clearly done in house. Then tried the trick of ordering the tamagoyaki, according to this book I read this is the way to tell if you have a good sushi chef. It was delicious so I guess IF passed that one! 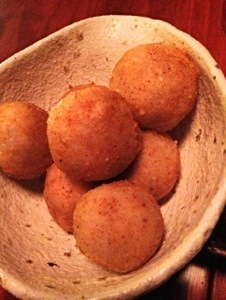 Then the Japanese fried potato (deep fried spiced taro $6). I had no idea what these were going to look like when they came to the table – had clearly been dusted with Shichimi tōgarashi. 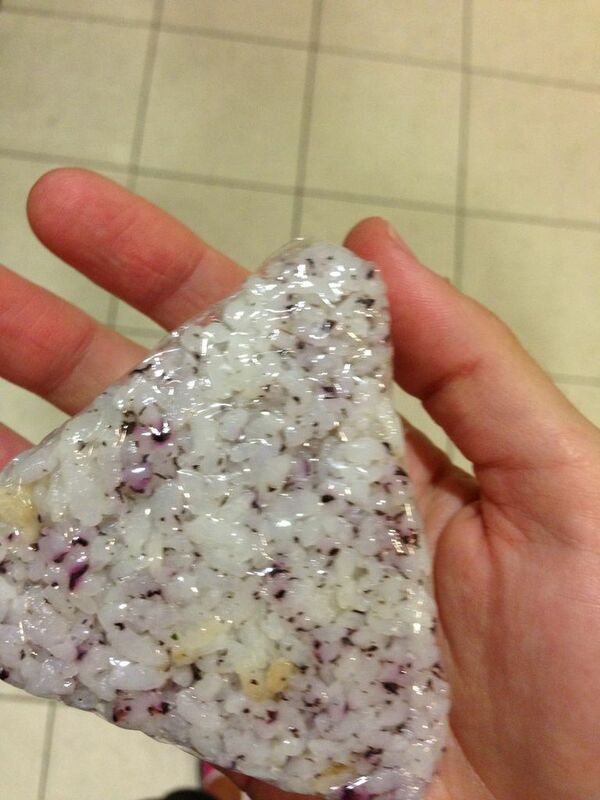 Very interesting texture, somehow a bit more gelatinous than expected, but super tasty. 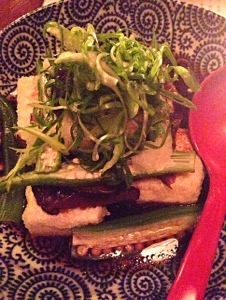 Then the vego staple Agedashi tofu (Deep fried tofu, braised shitake mushrooms with okra $13.50). My dining companions remarked that okra was now the new ‘thing’ as it is on every menu everywhere. Either way – yum! 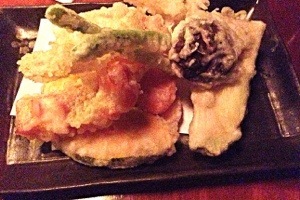 Another vego staple in the vegetable tempura (Assorted tempura vegetables $15) – this was good but being all winter vegetables was not my favourite ever. I do like that it’s seasonal though. Then the delicious mackerel (Grilled mackerel tossed with grated daikon and soy $13.5)- my favourite fish and one that is generally considered pretty sustainable (depends on species though). We almost didn’t get dessert, I now understand what a mistake this would have been. 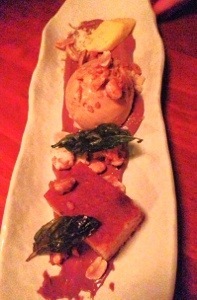 Behold the FUJIYAMA Snickers (‘Get some Nuts’ Peanut butter cake, chocolate custard, Salted caramel ice-cream and peanuts $13.50). The only thing wrong with this was that I had to share. 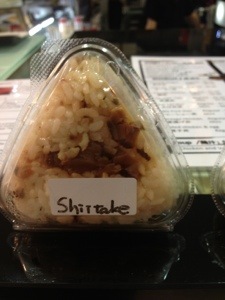 Easily my favourite cafe in Melbourne is the wonderful mina no ie in Collingwood. 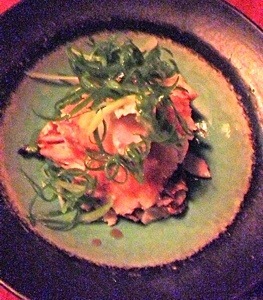 This Japanese inspired place is sister of the also gorgeous Cibi in Collingwood. Cibi also sells homewares but mina is just a really simple, gorgeously sunny place with an open kitchen. Their sencha tea is lovely, but Bonsoy flat white was impossible to pass up. 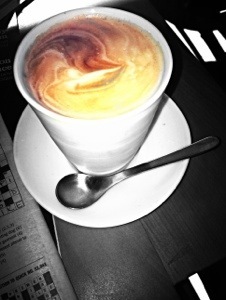 Fabulous coffee. 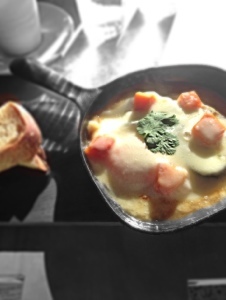 Their baked eggs with sweet miso and eggplant and pumpkin and provolone are the stuff of dreams. Sweet and creamy and salty. Possibly the best breakfast in the world. Lunch menu starts at 11:30 am.